For Multi-purpose and off road 4x4 vehicles (50% on-road, 50% off-road). Excellent traction on all types of terrain. Extended tread pattern on the sidewalls. Heavily siped deep and aggressive tread pattern. Exceptional sturdiness and long life. Carcass with Trigard structure (three protective plies). Stiffer tread area with two full width steel belts. Choice of distinctive raised white letters on one sidewall and black outline serrated branding on the other. The tread pattern extends onto the sidewalls. Deep aggressive tread pattern with high sipe density. Casing with Trigard structure (three protective belts). 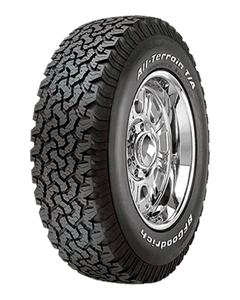 Sorry, we currently do not have any tyres with the All-Terrain T/A KO pattern in stock.